Bursting with flavour, and infused with the sweet, slightly tart flavour of fragrant lemon and orange peel, melted butter and studded with poppy seeds, this delicious Lemon & Orange Poppyseed Bread is perfect for breakfast or with a hot cup of tea in the middle of the afternoon. The crowning glory is the sweet sugary lemon-orange glaze that's brushed over the cake while it's still warm, infusing the bread with a sweet and tangy citrus flavour that will keep it moist and delicious for days. 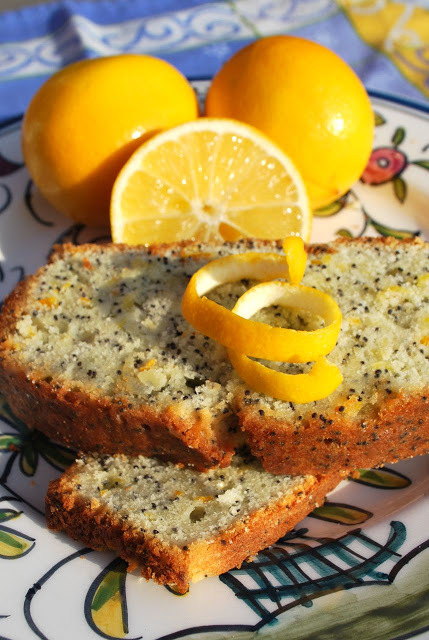 So if you're needing a little taste of summer, this light and luscious Lemon & Orange Poppyseed Bread will definitely add some sunshine to the day. Preheat the oven to 350°F. Butter and flour the bottom and sides of a loaf pan. Line the bottom of the pan with parchment paper and butter and flour the paper. In a small bowl, whisk together the eggs, vanilla extract, and milk, then set aside. Using an electric mixer, beat the flour, sugar, baking powder, salt, lemon zest, orange zest and poppy seeds until well combined. Add the softened butter and half the egg mixture and mix on low speed until moistened. Increase the speed to medium and beat for about one minute. Scrape down the sides of the bowl and add the remaining egg mixture and beat well. Pour the batter into the prepared pan and bake for about 55-65 minutes, or until the bread is golden brown and a toothpick inserted in the center comes out clean. When the bread is done, remove from the pan and place on a wire rack to cool slightly. To make the lemon orange syrup, place the sugar, and fresh squeezed lemon and orange juice to a small saucepan and bring to a boil over medium heat. Cook until the sugar is dissolved, stirring constantly. Pierce the warm loaf all over with a toothpick, then brush the top of the loaf with about half of the hot lemon syrup. Brush the remaining syrup onto the bottom and the sides of the loaf. Let the lemon loaf cool before wrapping and storing overnight, to allow the lemon syrup to penetrate the loaf.